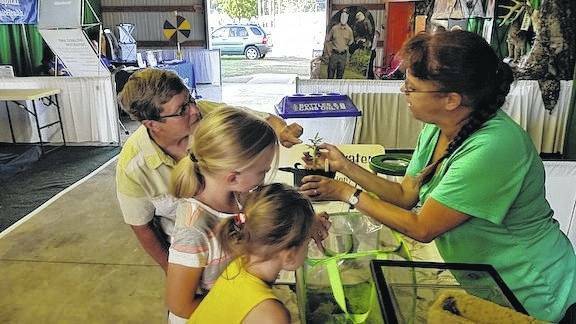 MOUNT GILEAD — Marilyn Weiler, Gail West, Matt Stooksbury, and Mia Shotwell gave fair goers a look at programs and events coming to Headwaters Outdoor Education Center this fall. “Wee” Discover Preschool Program begins next week on Thursday, Sept. 7 and continues on Thursdays through Oct. 26 at Headwaters Outdoor Education Center. There are two sessions each Thursday at 10:15 a.m. and 12:45 p.m.
Three, four, and five year olds, accompanied by a caregiver experience nature at the center with certified teachers and special guests. The program includes short hikes, hands-on activities, stories, songs and take-home projects. No registration or fees are required. Headwaters volunteers will host the 17th annual “Wild Run” on Sunday, Sept. 24 with registration at 12:30 p.m. The run is a two mile race with a one mile walk and dog walk. There is also a half mile kids’ fun run. Race entry fee is $10, but there is no fee for walkers or kids unless they want to purchase a Tee Shirt. The next fall event will be a Scavenger Hunt for night animals and night skies viewing on Sat. Oct.14 at 5 p.m. Weiler said there will also be an opportunity to look at the skies through a telescope. The Headwaters Center is an ideal place to view night skies since there are no city lights in the area. Sunday, Nov. 5 will be a make and take from 2-4 p.m. for “nature gifts and crafts.” Participants can make crafts from a varied collection of leaves, pine cones and other items found in nature. Headwaters Center is located at 151 Home Road (County Road 76) just east of Mount Gilead off State Route 42, north of the Morrow County Jail. Their display was featured at the fair’s south commercial building along with the Morrow County Conservation Club and Soil and Water Conservation. They worked with Morrow Environmental Education Committee (MEEC) for Earth Day at the Fair to bring conservation and nature activities to fair goers. For information on Headwaters Outdoor Education Center programs: Weiler Mapleturn@centurylink.net or Morrow Soil and Water Conservation District, MSWCD, 419-947-7923.